Located on the west coast of Peninsular Malaysia, Selangor is the most developed states in Malaysia with good infrastructure including wide highways and an extensive public transportation system. With a land mass totalling 8,104 km3, Selangor also serves as the gateway to many other birding destinations in Peninsular Malaysia with the Kuala Lumpur International Airport (KLIA) and the Kuala Lumpur International Airport 2 (KLIA2) located in the state. Despite its rapid development, Selangor boasts of many natural ecosystems that support a high diversity of birds. Selangor is the most developed state in Malaysia yet she has many natural ecosystems that support a high diversity of birds. 60 kilometres from the capital city of Kuala Lumpur, the 240 ha park is located in the coastal town of Kuala Selangor. 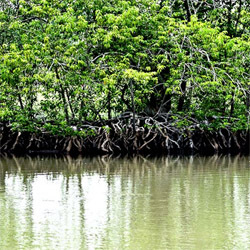 Its unique ecosystems comprising mangrove forests, secondary forests, tidal mudflats, lakes and canals provide for a diverse list of birds totalling about 160 species. It forms part of the IBA MY11 and is one of the main birding sites frequented by birdwatchers and in the migration season, tens of thousands of waders. Festival of Wings organised by Kuala Selangor Nature Park in the month of October. 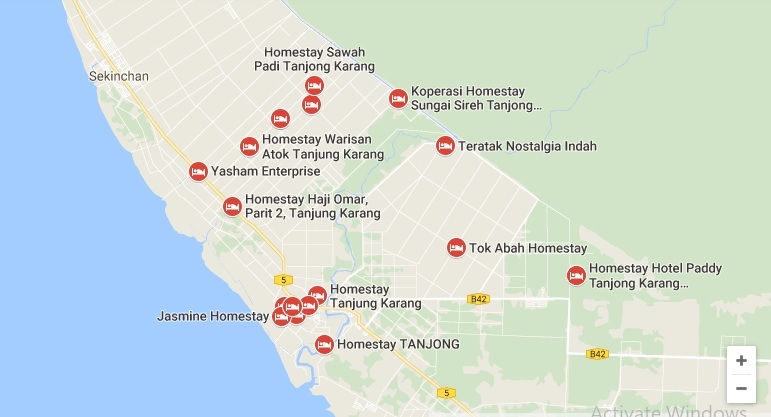 From mangroves to magnificent vistas of paddy fields, Tanjong Karang is a mere 20 km away from KSNP and the Kuala Selangor town. 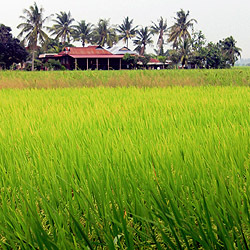 The paddy fields and irrigation canals are home to a wide variety of bird species. The paddy planting seasons also provide different habitats for seasonal birds including various migratory waterbirds. Watercock, Cinnamon and Yellow Bitterns, Chinese Pond Heron, Red-legged Crake, Slaty breasted Rail, White-breasted Waterhen, Greater Spotted Eagle, Pied and Eastern March Harriers, three species of munias, Paddyfield Pipit, White-breasted Wood-swallow etc. 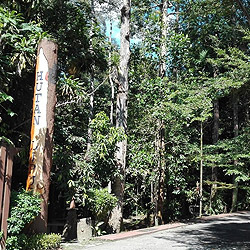 At the foothills and regarded as a gateway of the popular birdwatching hub Frasers Hill, Pahang lies a rustic, former mining town called Kuala KubuBaru. Framed by a backdrop of rainforest and hills, rows of heritage shophouses from colonial days mingle alongside clusters of traditional houses. 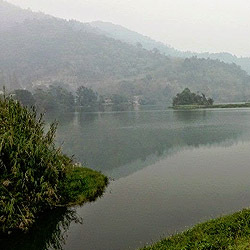 With the Sungai Selangor Dam and the Chilling waterfalls lying on the outskirts of the town, birdwatching at KKB can bring about surprising results. 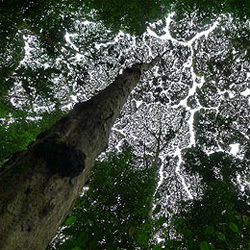 Designed as a garden city, the numerous mahogany and tembusu trees planted host a variety of bird species. 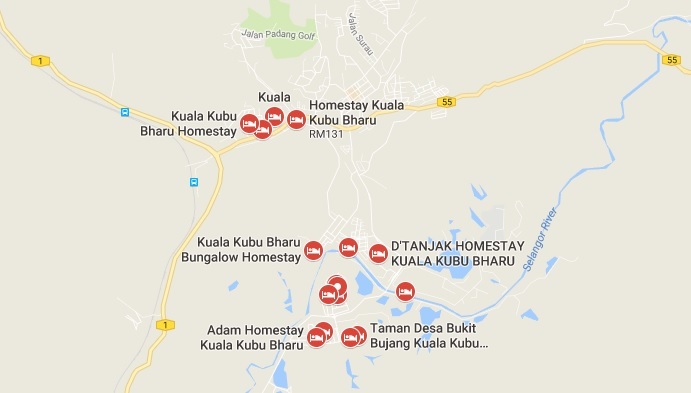 Nearby areas to bird watch include Sungai KedondongRecreational Forest, Taman Milenium’s lake system and the Hulu TamuHotsprings. Wings of KKB organised by the Hulu Selangor District Council. For further information, go to wingsofkkb.blogspot.com or call 03-6064 1331 for details. The Sungai Congkak Recreational Forest is a 2,280 hectare piece of pristine tropical forest, located in the Hulu Langat district of the Selangor state. Located approximately 33.5 km from Kuala Lumpur, Sungai Congkak boasts of 41 species of diurnal birds, making this site an interesting birdwatching haven for birders. Just about half hour away the bustling metropolis of Kuala Lumpur lies an oasis of tropical beauty and easily one of the most accessible birdwatching sites in the city. If you need a quick introduction to the birds of the Malaysian lowland forest, look no further than the lush Forest Research Institute Malaysia (FRIM) located a mere 16 km northwest of the capital city. Located in Kepong, FRIM is a government-based forest reserve established in 1926 and comprises 600 ha of forest plantations and regenerating secondary forest. A tiny little gem hidden from view, the Ampang Recreational Forest or Taman Rimba Ampang is only about 8 km from the iconic KLCC. It is a relatively small site measuring 25,000 ha (out of which only 50ha is open to public) and consists of a beautiful primary lowland forest. Despite its proximity to the city centre, it’s part of the Selangor State Park Important Bird Area (IBA MY10), and has recorded a whopping 197 bird species around its small swath of forest with a clear clean river flowing through. 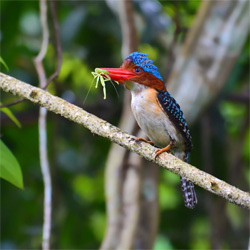 The globally threatened Blue-banded Kingfisher and other lowland specialties such as the Asian Paradise Flycatcher, Yellow-rumped Flycatcher, Orange-headed Thrush, Rusty breasted Cuckoo, Grey Wagtail, Diard’s Trogon, Scarlet-rumped Trogon, Asian Fairy-Bluebird, Scarlet Minivets, Velvet Nuthatches and the beautiful Rhinoceros Hornbill. Commonly sighted birds also include bulbuls such as the Red-eyed Bulbul, Grey-bellied Bulbul, Yellow-vented Bulbul, Olive-winged Bulbul, Greater Racquet-tailed Drongo, Raffles Malkoha, Whiskered Tree-swift, Gold-whiskered Barbet, Orange-bellied Flowerpecker, Blue-winged Leafbird, Buff-rumped Woodpecker, Black-and-Yellow Broadbill, Banded Broadbill etc.